WOODBOROUGH is a parish and large straggling village, in a narrow dale near the Dover Beck, 8 miles N.E. by N. of Nottingham. Its parish is in Basford union, Nottingham county court and bankruptcy court districts, Thurgarton wapentake, Nottingham petty sessional division, Woodborough polling district, Rushcliffe parliamentary division of the county, Southwell rural deanery, Nottingham archdeaconry, and Southwell diocese. It had 889 inhabitants in 1881, and comprises 1940 acres of land: the rateable value is £4273. 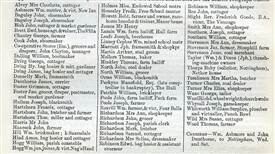 The common was enclosed in 1798, when 252 acres were alloted to the three prebendaries of Oxton and Woodborough – 66A. 1R. 1P. to William Taylor, Esq., and 53A. 3R. 11P. to the late John Bainbridge Storey, Esq., in lieu of the great tithes and their manorial claims, they being both impropriators and lords of the manor, which is now in three divisions, called the Prebendal, the Copyhold, and the Freehold Estates. The Ecclesiastical Commissioners are lords of the manor, and Mansfield Parkyns, Esq., Thomas Huskinson, Esq., Lieut.-Col. Seely, M.P., Robert Howett, Esq., and Roby Thorpe, Esq., are the principal owners. The Hall was anciently the residence of the Strelleys and Bainbridges, and is now the seat and property of Mansfield Parkyns, Esq. The CHURCH (St. Swithin) is a large structure, consisting of nave, with aisles, chancel, and tower with four bells and clock. In the chancel, which is very large, is a fine sedilia, an aumbrey, and piscine. There is a small CEMETERY, with a mortuary chapel and lich-gate. The church contains some very fine fragments of ancient armorial glass in its windows, which, when perfect, was exceedingly beautiful. The Register dates from 1547. It is a vicarage, value £300, with residence and 55 acres of glebe. The Bishop of Manchester is the patron, and the Rev. F.G.Slight, B.A., is the vicar. The BAPTISTS, WESLEYANS, and PRIMITIVE METHODISTS have each a chapel here. The FREE SCHOOL, founded by the Rev. Montague Wood in 1736, now possesses a yearly income of £95, arising from a farm of 58A. 2R. 1P. at Blidworth, and 7A. 3R. 31P. of land at Stapleford. The poor have 20s. ; and 20s. yearly is paid to a master for teaching ten boys and girls to sing psalms, as interest of £40 from the bequest of William Edge in 1796. The Feast is held on the Sunday after the 2nd of July. Mr. Robt. Howett has a race-horse breeding and training establishment here. This page was added by Website Administrator on 05/01/2012.